This is not about work-life balance. It is about how much you should engage into the actual things that happen in the world (apart from business and economics) and how much to focus on working on your things. Maybe your business is about helping people with their actual problems? I do not mean luxury problems like food delivery because you are too lazy to get ouf of your house and walk a few minutes. The dilemma I feel a lot is: Do I want to make a big difference in the world now by working on-site where the problems actually exist, or will I make much money for some decades so I can make an even bigger impact in the world later? The latter I would call the Bill Gates appproach. The answer: What is more (most) important to you? What do you want to focus on? What is your idea of life? The worst thing is when you don’t decide and are in between the chairs all the time. Make a strong commitment and decision, execute it for a while (months, years) and observe yourself how it it feels for you to do it. If it feels good and you make progress and people appreciate what you do becauss you’re helping them, continue. If not, try another commitment. The important thing is to make a decision for yourself. Stop being vague. 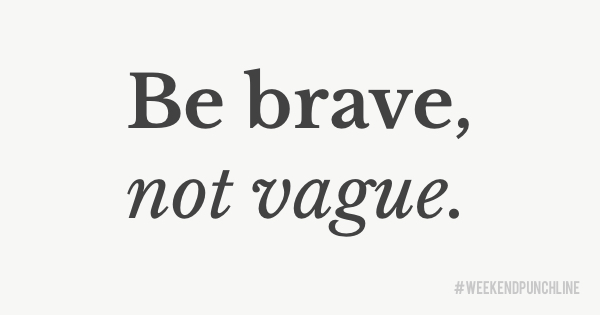 Start being brave. Making a decision is brave. I feel I want both. Yes, I’m maybe contradicting mysef a bit here. But I want to make an impact in the world now, and make a decent amount of money so I can help even more in the future. I want to make money to invest into myself and a peaceful world. This was episode 9 of the #weekendpunchline . Every Saturday and Sunday.